The roasted garlic in the hummus creates a sultry, mellow flavour, rich in taste without the pungent kick of raw garlic, and can be made a few days in advance to make day-of assembly a breeze. To make the hummus, preheat oven to 375°F (190°C). Cut off the very top of the garlic bulb so just the tops of most of the cloves are exposed. Wrap securely in aluminum foil and place in oven to roast for one hour. Remove and let cool. Using your fingers, squeeze the roasted garlic into the food processor. Add all remaining ingredients except for cilantro and jalapenos. If not completely smooth, add a dash or two of water until smooth consistency is reached. Test for seasoning. Refrigerate overnight if desired. When ready to stuff the jalapenos, preheat oven to 425°F (220°C). 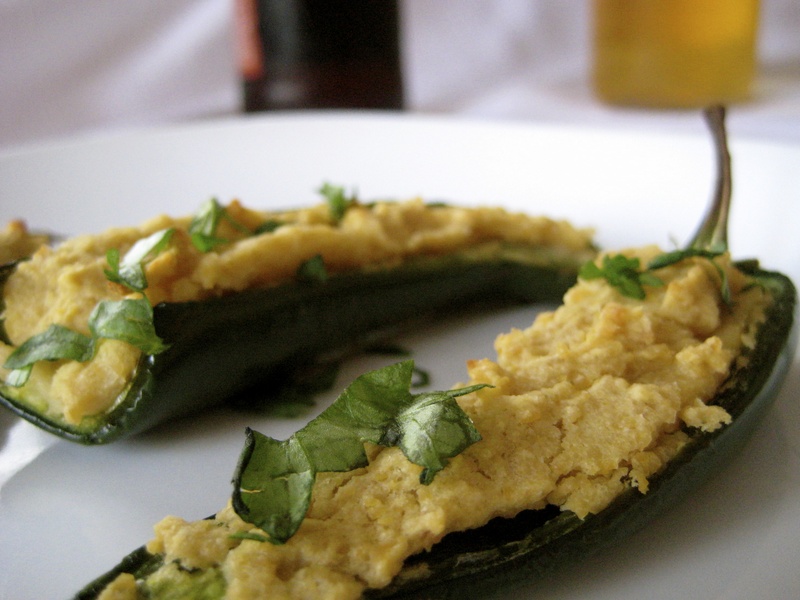 Spoon hummus in each jalapeno half, filling the crevasses, and transfer on a baking sheet. Depending on the size of the jalapenos, you might have some left over (eat it within a few days). Bake the stuffed jalapenos for 17 to 20 minutes, until jalapenos are tender but still slightly firm. Garnish with cilantro if desired. Serve at room temperature.